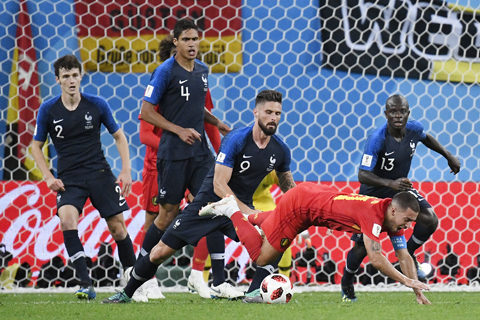 ST PETERSBURG: Samuel Umtiti’s 51st-minute header sent an impressive France into the World Cup final with a 1-0 win over Belgium in an absorbing first semi-final yesterday. Didier Deschamps’ side will face England or Croatia in Moscow on Sunday as the French look to lift the trophy for the second time following their triumph on home soil in 1998. In an enthralling tactical match, it was once again a set-piece that proved decisive with Umtiti’s near-post header from an Antoine Griezmann corner settling matters. Hazard was dangerous again moments later when he cut in from the left and unleashed a rasping drive which clipped off the back of Raphael Varane and just over the bar. From a Belgium corner, Toby Alderweireld tested Lloris with a smart shot on the turn but as the half progressed France began to create more. Olivier Giroud flashed a header just wide and Mbappe set up Benjamin Pavard whose low shot was kept out by the outstretched leg of Courtois. It was a fascinating first half and all that was missing was a goal but one came soon after the break.